This is the fifteenth installment of the What Happened Book Club, where we are doing a chapter a week. So! Let us continue our discussion with Chapters Fifteen and Sixteen: Election Night and Why. It's not that I don't think "Why," in which Hillary Clinton writes in detailed sections the various things she believes contributed to her loss, is an interesting or important chapter. To the contrary, I believe it's both! I'm just not especially moved to explore that territory again myself, having done so much of it already over the course of the last year. If it's all my fault, then the media doesn't need to do any soul searching. Republicans can say Putin's meddling had no consequences. Democrats don't need to question their own assumptions and prescriptions. Everyone can just move on. I wish it were that easy. But it's not. So I'm going to try to explain how I understand what happened, both the unexpected interventions that swung the race at the end, and the structural challenges that made it close to begin with. You don't have to agree with my take. But counter with evidence, with a real argument. Because we have to get this right. Damn straight. I have been yelled at many times over the past year for "relitigating" either the primary or the general election, when I have zero interest in doing that. I do, however, have a vested interest as a voter in what I want to be a functional democracy, not as a "bitter Clinton supporter," in examining failures to make sure that we don't repeat them. 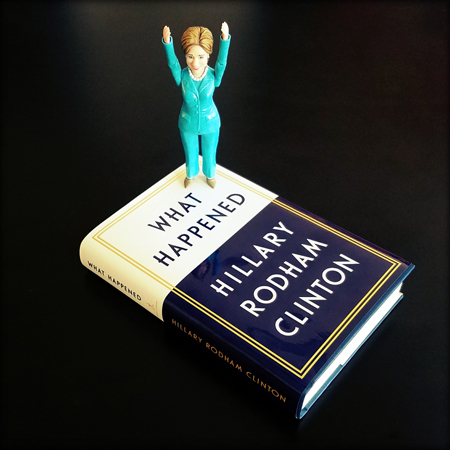 So, I'm a big supporter of Hillary's "Why" chapter, even though I am personally more keen to discuss "Election Night." It's one of the shortest chapters in the book, and was one of the hardest for me to read. First, I have to highlight this bit, about the night before Election Day, because I WAS THERE! I was exhausted but happy and enormously proud of my team. 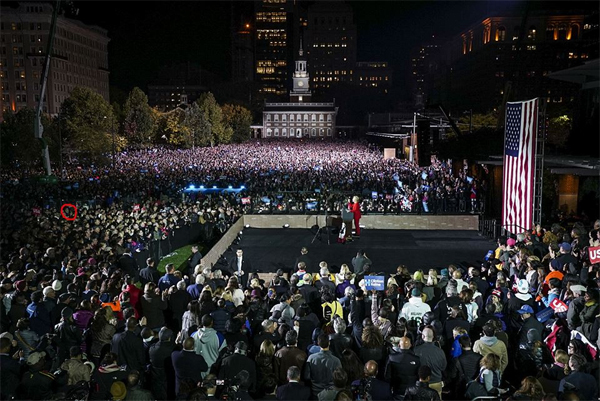 Standing with Bill, Chelsea, Barack, and Michelle in front of tens of thousands of people at Philadelphia's Independence Hall was one of the high points of the entire campaign. The President hugged me and whispered in my ear, "You've got this. I'm so proud of you." That was an amazing night, and it is really thrilling to have been part of one of the high points of the campaign for Hillary. It was certainly one of the high points of the campaign for me! That's Iain and me inside that red circle! It's quite something to see your name on a ballot. After twenty months, twelve debates, and more speeches and town halls than I could count, it all came down to this. All over the country, 136 million people were going to look at my name and Donald Trump's name and make a decision that would shape the future of the country and the world. And now I'm getting all choked up again, just thinking about that day, and how moved and excited I was to be able to cast my vote for Hillary Clinton in the morning, and how devastated I was by the end of the night. I think about my mother every day. Sometimes I think about her on that train. I wish I could walk down the aisle and find the little wooden seats where she sat, holding tight to her even younger sister, alone, terrified. She doesn't yet know how much she will suffer. She doesn't yet know she will find the strength to escape that suffering — that is still a long way off. The whole future is unknown as she stares out at the vast country moving past her. I dream of going up to her, and sitting down next to her, taking her in my arms, and saying, "Look at me. Listen to me. You will survive. You will have a good family of your own, and three children. And as hard as it might be to imagine, your daughter will grow up and become the President of the United States." I am as sure of this as anything I have ever known: America is the greatest country in the world. And, from tonight, going forward, together we will make America even greater than it has ever been — for each and every one of us. That was the speech Hillary Clinton wanted to give, and the future for all of us she envisioned. Instead, we've got a president who wants to plunge America into toxic mud, and Hillary had to deliver a concession speech. The speechwriters gingerly approached with a draft of a concession speech. I honestly wondered why anyone would want to hear from me ever again. That breaks my heart into a million pieces. I know it's apparent, given this series, not to mention all the other things I've written about being glad Hillary Clinton won't shut up and go away, but I'll say it again, anyway: I want to hear from Hillary Clinton. And I do not consider having failed honorably at something a reason not to listen to a woman for the rest of her life. That is a threshold I find entirely unacceptable — because it sets perfection as the cost of entry.